Greater NOIDA, Feb 22: Afshan Fatima played the best round of the season with a superb three-under 69 on the second day of the fifth leg of the Hero Women’s Pro Golf Tour 2018. Afshan, 21, may well have been two shots better but for a late double bogey on Par-3 16th. 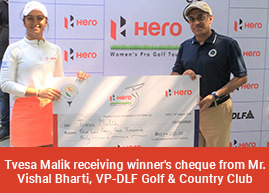 The card of 69 made up for the 75 on the first day and she zoomed up to Tied-2nd, one shot behind Neha Tripathi (72). Afshan, who has not finished in Top-5 in any of her three starts this season, is now even par 144 alongside Saaniya Sharma (70), while Neha Tripathi is one-under 143. Amateur Tanirika Singh underlined her potential with a fine 72 that put her in sole fourth place at one-over 145, while overnight co-leader Gursimar Badwal slipped to fifth after an error-laden front nine which she played in six-over 42. Tvesa Malik (72) and Anisha Padukone (74) are Tied-6th at 3-over 147, while Sonam Chugh (79) who held a share of the first round lead, fell to eighth place. Siddhi Kapoor (74) and Ayesha Kapur (77) rounded off the top ten. The Jaipur-based Afshan, who is playing her fourth season as pro, is still looking for her first win. On Thursday, she opened confidently with a string of pars before her first birdie on fifth. She then dropped a shot on Par-5 sixth, which was neutralized by a birdie on Par-3 eighth, as she turned in one-under 35. It was on the back nine that she was in full flow. After a bogey on 10th, she birdied both 11th and 12th, then eagled the Par-5 497-yard 13th and again birdied the Par-4 14th to card an impressive five-under in the four holes from 11th to 14th. She seemed set for sole lead but a double on Par-3 16th took away some of the sheen and she finished at 69. Neha had three birdies against three bogeys in her even par 72, while Saaniya had four birdies, three of them on the front nine, and two bogeys in her fine 70 that was wrapped up with a birdie on 18th. Amateur Tanirika had her own birdie streak from ninth to 11th with three in a row in her 72. Gursimar suffered a terrible setback from sixth to ninth as she bogeyed three in a row and double bogeyed ninth. She carded 76 and is now two-over 146 in fifth place. Trisha Sunil and Mehar Atwal will start the proceedings on the final day while Millie Saroha, Tavleen Batra and Smriti Mehra will play in the second group. The third group comprises Khushi Khanijau, Suchitra Ramesh and Ayesha Kapur. Siddhi Kapoor, Sonam Chugh and Anisha Padukone follow them, while Tvesa Malik, Gursimar Badwal and amateur Tanirika Singh will be in the second to last group. Saaniya Sharma, Afshan Fatima and Neha Tripathi will go out last in the leader group.